Shia & Sunni Muslims have Lived in Iraq and other countries in Harmony , in such a way that they are inter mingled and are have strong relations , due to inter Marrianges for ages , but Due to the Western Implemented Policies of Divide and Rule , Sectarianism is being Infested and above all Portrayed by the Western Media , and as the Saudis are also the Western Implanted Agents in the Muslim World , so they have also facilitated the Western World , in Promoting the Western Ideology of Divide and Rule , and thus enforcement of their Sectarian Based Takfiri Ideology , which helps the Western Intersts and their goals to be Implemented in the Mineral Rich Middle East and the Golden Land of Asia Pacific , So thus as in the Present Scenario Saudi and the Western Media has Portrayed that their is a Huge Conflict going on between Shia and Sunni Sects of Islam , which is Based on Mere Lies , as the Picture Speaks for itself that there is no Conflict of Interest in the Shia and Sunni Population , and they are still living in Peace and Harmony in Iraq and other Countries , but it is Only the Takfiri Wahabi Ideology which is being rejected by the Muslims and all the Peace Loving People of the World. JNN 18 Apr 2013 Fadak (Arabic: فدك‎) was a Garden Oasis in Khybar, a tract of land in northern Arabia , it is now part of Saudi Arabia. Situated approximately thirty miles from Medina, Fadak was known for its water-wells, dates, and handicrafts. When the Muslims defeated the Jews of Khybar , which was a very Heavily guarded and Strong Fort of Jewish Community , who were attacking Muslims from the fort , and for which about 40 Days the Battle was going on from the Muslims , but as the Fort was Heavily guarded and was so Strong that it could not be conquered despite all the efforts , and finally when the Prophet Muhammad PBUH Declared that finally , he will deliver the Flag of the Muslim Forces the Next Day to the Person who will definitely conquer the Fort of Khyber , as he will be a True Man , a Strong Man , he ll be a Man who ll never run away from the Battle field , So every body Prayed all night that the Next Day the Flag , should be awarded to him by the Prophet Muhammad PBUH . The Next Day as all lined up to Hear the final choice of the Prophet Muhammad , and as every one was hopeful to get the flag , as Hazrat Ali a.s , was not Present in the Battle field ,as every body knew that he is the Most recommendable Man in this case , but in his absence they could be Potential contenders , but when the Prophet came out , he Inquired about Hazrat Ali from his companions , but as he was not feeling well and has not joined the Battalion which was taking part in the Battle of Khyber , so finally the Prophet Muhammad called “ Ya Ali ” , and by the grace of God , Hazrat Ali a.s , who was Miles away from the Battle field , and was not even felling well , was seen riding on his horse coming towards the Prophet , As the God responded by a Charisma to the word of the Holy Prophet , and he came to the Prophet on his call . As he came he Greeted the Prophet , upon inquiry by the Prophet he told that as he have some infection in his eyes ,so he has some visibility problems , therefore was not able to join the Battle , on which Prophet Muhammad took a little saliva from his mouth and applied in both the eyes of Hazrat Ali , and again with the Charisma God has gifted to the Holy Prophet PBUH, Both the infected eyes of Hazrat Ali became exactly fit and Bright , and then finally the Prophet awarded the Flag of the Muslim Army to Hazrat Ali a.s , and asked him to lead the Army to conquer the Fort of Khyber, which he happily accepted . And He Bravely , went towards the Fort , and challenged the enemies of Islam, and with the force and Power gifted to him by the God , he shook the Doors of the Fort , and as every body knew that the Door which could not be opened by atleast by 40 Powerful men , But Hazrat Ali a.s ,who was gifted immense strength by the Al Mighty Allah , shook the Doors of Khyber Fort and tore apart the Door of the Fort , and secondly hold the door up above , so the door can work as the bridge for the Muslim army , as there was deep dungeon around the fort. And finally when the door of the Fort of Khyber was torn down and the Muslim Army crossed the Dungeon and entered the Fort , in the leadership of Hazrat Ali a.s , the Fort of the Khyber was conquered by Muslims . And finally all the Property and the Belonging which were conqurered by Muslims were evenly distributed among the Muslim force by the Prophet Muhammad PBUH himself , who kept the Garden of Fadak , which was a Oasis in the center of Desert , for himself ,as his share in the battle of Khyber. And as per Muslim Laws of Inheritance , The Property of the Deceased to be Right of His/her Heirs , but the Injustice was done with the Only Heir and the Daughter of the Last and Final Prophet of Islam by the Sitting Caliph , and She was denied the Right to acquire the Garden of Fadak . Garden of Fadak is an Oasis Deep in the Deset of Arabia, Near the Fort of Khyber, and The Garden was prime Piece of Land, Known for its Water Wells, Date farms and the Handicrafts made by the Local Women. The Garden of Fadak was the Property of Bibi Fatma s.a , the Most Beloved Daughter of the Last Prophet , who was not given her rightful share from the Inheritance of her father , and this was the first Injustice which was done with her after the Death of the Prophet . The first ever coin to have the Inscription of Basic Islamic Principal ‘There is no God except Allah and Muhammad is his Prophet ‘ is set to sell for hundreds of thousands of pounds when it goes under the hammer. 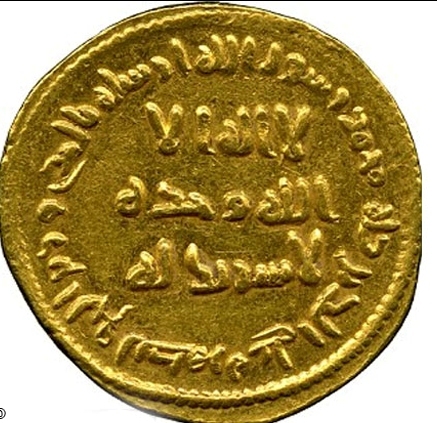 The historic gold dinar from 690 AD was minted in Damascus by the Umayyad dynasty . The coin, which weighs 0.15oz and is slightly larger than a 5p coin, comes in a set of 56 gold dinars struck between 690 and 750 – expected to sell for £500,000 at auction next month. Dated 77 in the Islamic calendar, the words written on the coin translate in English to: ‘There is no God except Allah and Muhammad is his Prophet ‘. The Kaaba is a cuboid-shaped building in Mecca, Saudi Arabia, and is the most sacred site in Islam. The Qur’an states that the Kaaba was constructed by Prophet Abraham (P), and his son Prophet Ismail (P), after the latter had settled in Arabia. The building has a mosque built around it, the Masjid al-Haram. All Muslims around the world face the Kaaba during prayers, no matter where they are. This is called facing the Qiblah. One of the ten branched (Furoo-e-deen) of Islam requires every Muslim to perform the Hajj (pilgrimage) at least once in his or her lifetime if able to do so. Multiple parts of the Hajj require pilgrims to walk seven times around the Kaaba in a counter-clockwise direction. This circumambulation, the Tawaf, is also performed by pilgrims during the Umrah (lesser pilgrimage). Frequent natural disasters that may occur in the Mecca area is flooded. Certainly the largest in the flood of Noah. At that time the entire Kaaba building collapsed. Flooding also occurred several times in the time of Prophet Muhammad. After his death, at the time of Caliph Umar bin Khattab, the flood damage the walls of the Kaaba. One of the flooding that had documented the massive flooding in 1941. In a widely publicized picture, looks the part submerged in the Haram mosque hinngga some poles made of weathered wood and brittle. The Saudi monarch was forced to do the repair several times to overcome this. Flooding often occurs in Mecca because of the geographic location of the city is flanked bbeberapa hill in Mecca to make low-lying plains like a bowl. Rain water cannot be easily absorbed by the soil, given the arid Middle Eastern lands. As a result the flooding could last for some time. Plus, the drainage system is not as good at that now. This is the first mosque and shrine of Kashmir, built by Sultan Sadrudin (Rainchan Shah), who was once a Buddhist prince, and was converted to Shia Islam by Hazrat Shaf u Din in 1320 A.D. and the first Shia sultan of Kashmir. Hazrat Shraf ud Din Shah, passed away 1327A.D. 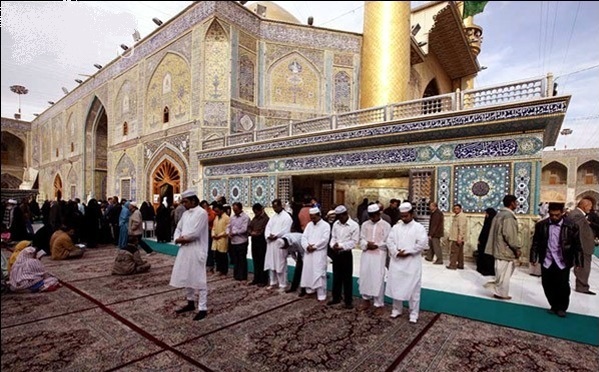 Sultan Sadrudin (D.1323 A.D) is also buried in the same compound as Hazrat Abdul Rahaman. Hazrat Abdul Rahaman Shraf u Din was the descendent of seventh Imam of Shia, Imam Moosa Kazim (a.s). four courtyards, 250 meters long and 47 meters wide with a well-arranged layout.